Fish Feet. I Want Them. 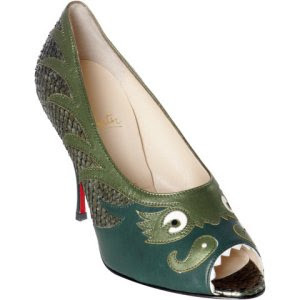 Christian Louboutin still hasn’t sent me these delightful shoes despite my helpful hints on this blog. Now Shoewawa tortures me with this post. Bad Shoewawa! How could anyone fail to see how perfect my life would be if only I had fish feet? omg i hate this!! i’m sorry but.. it’s just.. so.. weird.. kinda cheapens the brand but. i guess. it’s my opinion!! haha. You clearly don’t see the beauty of wearing red tights with these shoes and having your toes look like a GIANT RED TONGUE! How fun would that be? A lot of fun, I say! Oh my! Haha, I can’t say I would ever wear them, but they are super-cute! These shoes are odd and that attracts me to them.I think my lil brown toes would look nice acting like they were being sucked into a fish’ s mouth! Oh, no, a shark fin hat I think would be very appropriate. Imagine the 5th Ave crowds making way for you when they see that dorsal fin coming at them! About the late great Mr. Chubbs…I want to get the divine Keith to do my hair when my time comes. I want to look good for the pictures in case Wendy posts them on her blog. I don’t know.. it’s getting awfully close to that point. Help! And these shoes deserve a little love too methinks. No, no, MissC! No bad touching! oh my word, my mouth is open at these as wide as the fishes! i love love love, but don’t think i would ever have the gall to wear or even the funds to procure, both so unfortunate, because your red sock/tongue idea is phenomenal. I don’t really like these, I think it’s the shape of the shoe or something. Anyway, the Marc Jacob mouse flats are so adorable, I would love to have those. I feel as though I’ve seen these before somewhere…perhaps in a dream! I’m not an avid fan of shoes unless they’re extraordinary like this. As for me, I managed to find a pair of the Miu Mius I coveted for over a year on eBay. So there is always hope! Those Miu Miu shoes are stunning!!!! I LOVE this shoe! I want it! I want two, actually. One for each foot.